Unplanned : The Dramatic True Story of a Former Planned Parenthood Leader's Eye-Opening Journey across the Life Line is simply this: A Must Read. I was vaguely aware of her story when I picked up the book to read it, but not incredibly so. Abby Johnson was the director of one of the leading Planned Parenthood centers in the Houston area in 2009 when she was called in to witness an abortion. She was not usually in the room when an abortion was performed, but on this particular day she was called in to assist with an ultrasound-guided one. She watched as the baby's spine crumpled and its life was sucked away into a tube. This moment changed her life and this book tells of the dramatic change. 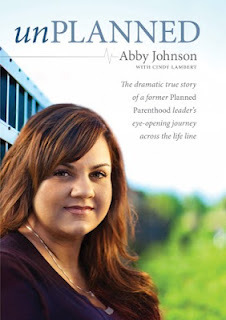 What I found interesting about Abby Johnson is that she consistently labeled herself a Christian and was following Christ. (I believe she was, by the way. I'm not doubting it.) Despite her Christian upbringing and leaning, she still felt as if abortions were a necessity for the health and safety of women. She explains in great detail how she began compromising her position on the value of life in college and how she ultimately became the director of this particular Planned Parenthood site. It is interesting to read her reflections on encounters with the pro-life movement during this time. I took her story for a warning to other Christians who are willing to compromise and say that abortions are ok in select situations. To take even one step away from the position that God is the creator and sustainer of life is to begin walking down a slippery slope. Once you start making exceptions, going so far as to argue about when, exactly, life begins, it's hard to stop. We need to catch ourselves in the Word of God and find out what He has to say about such things and abide by His decree. He forms life inside the womb and it is His and His alone to take away. For a human to enter the womb and remove the life of another is murder. To call it less is to compromise and there can be no two ways about it. Either God is or God is not sovereign. Either God is or God is not Creator. Either God is or God is not to be trusted to be working for our good and for His glory. Yes, some lives are formed "accidentally" from a human's perspective - but never God's. That is something that I think Christians need to own post-haste and defend as truth forever after. No, we don't understand why certain things come to be (unplanned pregnancies included) but just because they happen doesn't mean that God fell off His throne or that there is suddenly no value in the life being formed. I think Abby Johson's story screams about the slippery slope of compromise and the costs associated with turning away from scripture. The great thing about Unplanned is how Abby walks through her years as the Director, working in a place that performed abortions, while taking note of the pro-lifers who stood on the opposite side of her fence. She paints a wonderful picture of the pro-life movement on the whole, as particular members of it in her community reached out to her and let her know that they cared about her. She takes special care to encourage pro-lifers to approach the subject of abortion with calm humility and honest truth. Johnson never has been a fan of what she calls the "extremist" in the pro-life camp who yell, threaten abortionists and generally make a nuisance of themselves. The pro-lifers who spoke to the hearts of Abby and others in her Planned Parenthood center, were the ones who calmly stood outside the gate, praying and extending friendship. Her insight into the pro-life movement is particularly valuable as there is great passion within the ranks. (There is great passion on both sides.) Passion is good but it needs to be properly directed. I think Abby's point of view gives the pro-life movement something to consider. I appreciated hearing her take on things. Reading this book made me stop and think about how pro-lifers have come across as being more brash and in-your-face than I think they realized or even meant to be. Promoting thoughtful discussion on the topic of abortion is necessary while also being kind and loving. Still, we must take a stand for life and speak truth. A delicate balance is, I think, being achieved these days and that's in some part due to Johnson's experience which she is willing to share with others. I heartily recommend and encourage you to read this book. Whether you are or are not pro-life, it's an interesting take on someone who "crossed over" the line and changed their position. Her change took place after a rather dramatic and horrifying incident which makes the book spell-binding to the very end. Her story made me think about abortion. It also made me think about the beauty that is adoption. What if my son's birth mother had decided to "take care of her problem" and had an abortion? He would never be. And our family would not look as it does. We would be different people. But his life was precious and she gave him the gift of it. How thankful I am! Lastly, this book made me grateful for the grace of God who doesn't see fit to leave us as we are, but is always working on us and drawing us closer to Him. I've heard of this book -- I think I saw one other review somewhere. It sounds riveting. I agree with you about the slippery slope if we allow for abortion under any circumstances and the need to be kind and care for pro-abortion people as individuals. You are so hard on my book budget! :) This definitely sounds like a "must read". And I'm with you in being so, SO grateful my children's birthmothers chose life and adoption over abortion. :) OH YES! I agree...you kill the book budgets! I have the video...need to give it to my church though so more can see it. The book sounds even better, though the video is very good. I agree...the perspective on the prolifers was and is important. I just saw the name of this book before I even read your description and I knew I had to read it. My mom was a director of a CPC in California. It's pretty much in my blood. Thank you for the review and bringing it to my attention! I really like the part where she encourages CALM behavior, and not yelling threats. (Well, I actually like ALL of it). I've saw this one around a good bit, so I've been curious about it. I completely agree with you! This book is already on my to-read list but I'm glad you gave such a hearty endorsement of it! It sounds like an eye-opening read. I watched the thirty minute documentary a few months ago and then read the book. The documentary is interesting just because you can see Johnson talk about her experience, but it is pretty much the same as the book (just in a much less expansive format). I loved the book. It is interesting to get inside the head of someone "on the other side" and find out that she's not a vicious, baby-hating killer.